This group of FDL Pro-Series rear disc kits provides a complete solution for popular muscle car rear axles that require a parking brake. 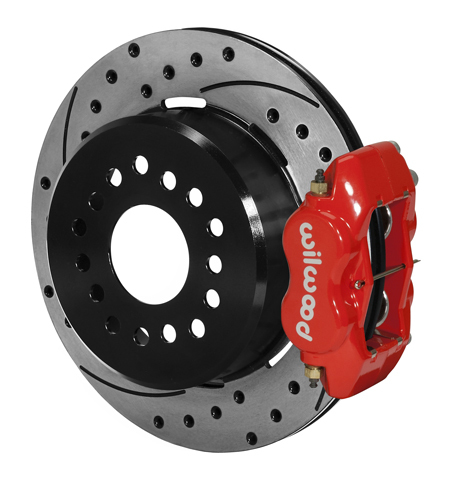 Forged billet Dynalite four piston calipers, 12.19” one-piece drum/rotors, and high friction pads provide optimized and balanced braking for all types of custom performance street/strip and show machines. The neatly hidden internal shoe system provides a clean installation with superior static holding power for parking. Optional caliper finishes and rotor designs enable the builder to personalize the style and optimize brake performance for every individual application.